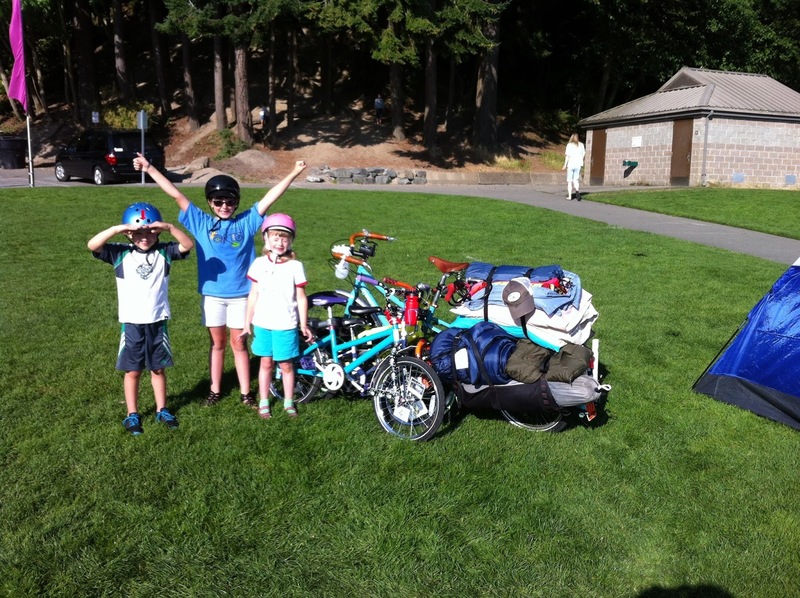 We're loading up our kids and tents to go bike camping at Owen Beach August 18, 2017! Pre-registration is required, so please read on. WHEN: Meet-up at 2nd Cycle Tacoma's Community Cycle Center on Friday Aug 18 around 5:30pm. We'll roll-out about 6pm to Point Defiance Park, a 7.5 mile ride. It will take about 1.5 hours. CAMP GEAR: We'll camp on the grass next to the beach and have to break camp by 9am. Keep it simple! We recommend tent, bedroll, change of clothes, warmer layers for the evening. You can haul your gear by bike (it's bike camping! ), or toss heavy/awkward items in the 2nd Cycle van that's meeting us there. Need a tent? Let us know in the comments and we'll try to locate an extra one for you. FOOD TO BRING: For the ride, bring a water bottle and maybe even a spray bottle to help keep kids cool. Metroparks provides evening snacks and a basic breakfast, but plan to bring a picnic dinner or snacks for after the ride. Don't bonk! RETURN: On Saturday morning families can make their way back home in small groups or individually. 2nd Cycle will offer gear hauling for those who need it. Remember, it's going to be more uphill on the way home, so plan for a longer ride. PRE-REGISTER: Everyone is welcome, but you must preregister with Matt Newport email kidicalmasstacoma@gmail.com. We have a limited number of campsites reserved for this Metroparks Tacoma event and need to have an accurate headcount. This is a bit different than most of our events and rides, but we hope to see you there. Please let us know if you register for your own campsite via metroparkstacoma.org so we can keep track of who's coming. More details and discussion on our Facebook event page. THANK YOU to the Puyallup Watershed Initiative Active Transportation Community of Interest for sponsoring this event! We had a fun group of riders from all over town. The weather was ideal and we had a blast. We are already making plans to do this campout ride again next year! Park Ranger Mark gave a cool nature talk and got creative with the campfire in spite of a park-wide burn ban. Bring your little dog, too! Proctor is the top of the hill for this 7.5 mile route. It was an easy pedal back to 2nd Cycle from here.